Hudaydah(ANN)-The United Nations humanitarian coordinator in Yemen has warned that a military assault on the vital Yemeni port city of Hudaydah by the Saudi regime and its coalition partners may kill 250,000 people. On Tuesday, a spokesman for the Saudi coalition declared that allied forces were 20 kilometers from Hudaydah, which is controlled by Yemen’s Houthi Ansarullah movement. The spokesman, however, did not elaborate on potential plans to launch an attack to seize the port, which serves as the main entry point for supplies needed to ease the famine and cholera epidemic. The UN’s Yemen mediator Martin Griffiths also voiced concern on Tuesday over attacks on Hudaydah by Saudi-sponsored militants in the country. “Apart from the avoidable humanitarian consequences of such a battle, I am also very concerned about the impact (on) chances of a political settlement of this conflict,” Griffiths said. Griffiths, who was wrapping up a three-day visit to Yemen, added that talks had been positive while underlining that a military action on Hudaydah would have a negative impact on its civilian population. “We are working very hard, focusing every day on moving forward in the political process. My aim is to restart negotiations which have not taken place for a very long time, for too long, and I want that to restart in the very near future,” he said. 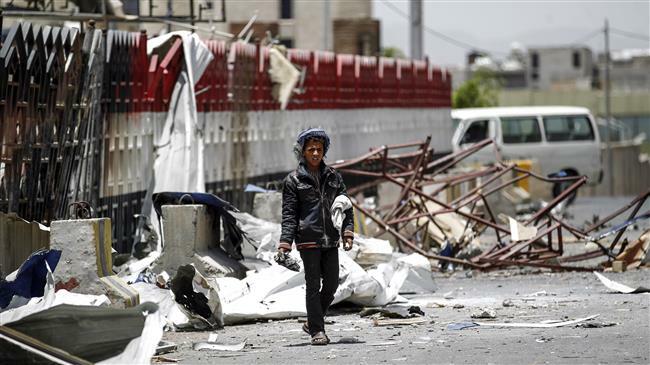 Griffiths is due to submit a report on the Yemeni situation to the UN Security Council on June 18. Humanitarian agencies working in Yemen remain deeply worried about the likely impact of a Saudi-led assault, since as many as 600,000 civilians now live in and around Hudaydah, which lies on the country’s Red Sea coast. Yemen, according to the UN, faces the world’s worst humanitarian crisis and 22.2 million Yemenis are in need of humanitarian aid, and 8.4 million are at risk of starvation, a number that will rise to 18 million this year if conditions do not improve. Meanwhile, Yemeni political sources are cited in a Reuters report as saying that Griffiths is also holding talks with the Houthis to hand over the control of Hudaydah to the United Nations in a bid to avert the potential assault. The sources also claim that a broader UN peace plan urges the Houthi movement to give up its ballistic missiles in return for an end to the brutal campaign against it by the Saudi aggressors as well as a transitional governance agreement. The International Committee of the Red Cross (ICRC) also announced on Thursday that it had pulled 71 international staff out of Yemen because of security incidents and threats, moving them to Djibouti. Furthermore, a United Nations vessel delivering humanitarian aid to Hudaydah on Monday came under a suspected Saudi attack. Yemen’s Red Sea Ports Corporation announced that the vessel used by the UN’s World Food Program (WFP) was attacked after delivering a shipment at Hudaydah.